It’s worth thinking about how things can go wrong, and what the implications of such occurrences might be. In this post, I’ll be taking a look at the HyperLogLog (HLL) algorithm for cardinality estimation, which we’ve discussed before. There’s an obvious vulnerability here: what happens to your counts if you get pathological data that blows up a register value to some really large number? These values are never allowed to decrease according to the vanilla algorithm. How much of a beating can these sketches take from such pathological data before their estimates are wholly unreliable? In practice, HLL registers are fixed to be a certain bit width. In our case, registers are 5 bits wide, as this allows us to count runs of 0s up to length 32. This allows us to count astronomically high in a 1024 register HLL. Repeating this for many trials, and stream sizes of 100k, 1M, and 10M, we have the following picture. The green line is the best fit line. It is this property that provides protection against totally wrecking the sketch’s estimate when we blow up a fairly small fraction of the registers. Note that some experiments appear to start after others. This is due to missing data from taking the logarithm of negative errors. Without getting overly formal in our analysis, there are roughly three phases in error growth here. At first, it’s sublinear on the log-scale, then linear, then superlinear. This roughly corresponds to “slow”, “exponential”, and “really, really, fast”. 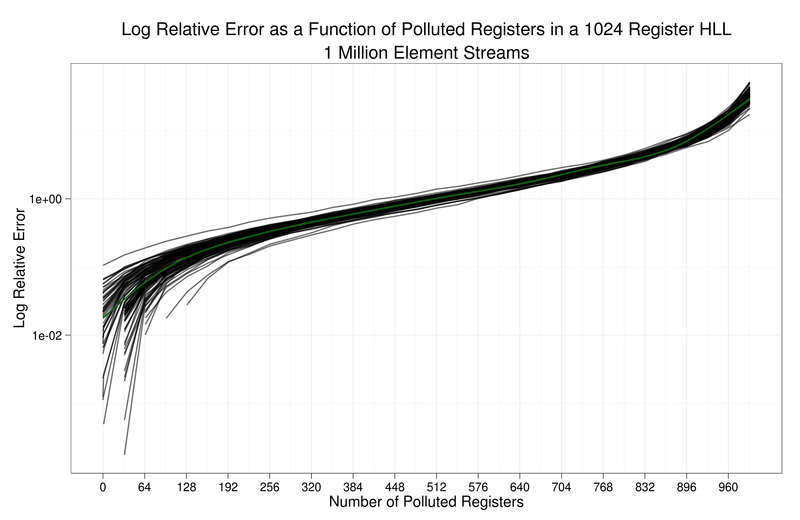 As our mathemagician-in-residence points out, the error will grow roughly as p/(1-p) where p is the fraction of polluted registers. The derivation of this isn’t too hard to work out, if you want to give it a shot! The implication of this little formula matches exactly what we see above. When p is small, the denominator does not change much, and the error grows roughly linearly. As p approaches 1, the error begins to grow super-exponentially. Isn’t it nice when experiment matches theory? It’s certainly nice to see that the estimates produced by HLLs are not overly vulnerable to a few errant register hits. As is often the case with this sort of analysis, the academic point must be put in balance with the practical. The chance of maxing out even a single register under normal operation is vanishingly small, assuming you chose a sane hash function for your keys. If I was running an HLL in the wild, and saw that 10% of my registers were pegged, my first thought would be “What is going wrong with my system! ?” and not “Oh, well, at least I know my estimate to within 10%!” I would be disinclined to trust the whole data set until I got a better sense of what caused the blowups, and why I should give any credence at all to the supposedly unpolluted registers. Author’s Note: This post is related to a few previous posts dealing with the HyperLogLog algorithm. See Matt’s overview of HLL, and see this post for an overview of “folding” or shrinking HLLs in order to perform set operations. It is also the first in a series of three posts on doubling the size of HLLs – the next two will be about set operations and utilizing additional bits of data, respectively. In this post, we explore the error of the cardinality estimate of an HLL whose size has been doubled using several different fill techniques. Specifically, we’re looking at how the error changes as additional keys are seen by the HLL. If we have an HLL of size and we double it to be an HLL of size , we call two bins “partners” if their bin number differs by . For example, in an HLL double to be size , the bins and are partners, as are and , etc. The Zeroes doubling strategy fills in the newly created bins with zeroes. The Concatenate strategy fills in the newly created bins with the values of their partner bins. MinusTwo fills in each bin with two less than its partner bin’s value. RE fills in the newly created bins according to the empirical distribution of each bin. Below, we ran four experiments to check recovery time. 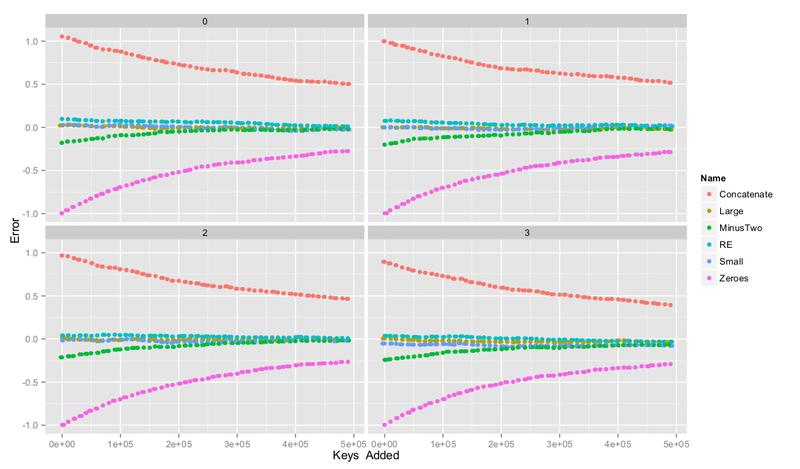 Each experiment consisted of running an HLL of size 210 on 500,000 unique hashed keys (modeled here using a random number generator), doubling the HLL to be size 211, and then ran 500,000 more hashed keys through the HLL. 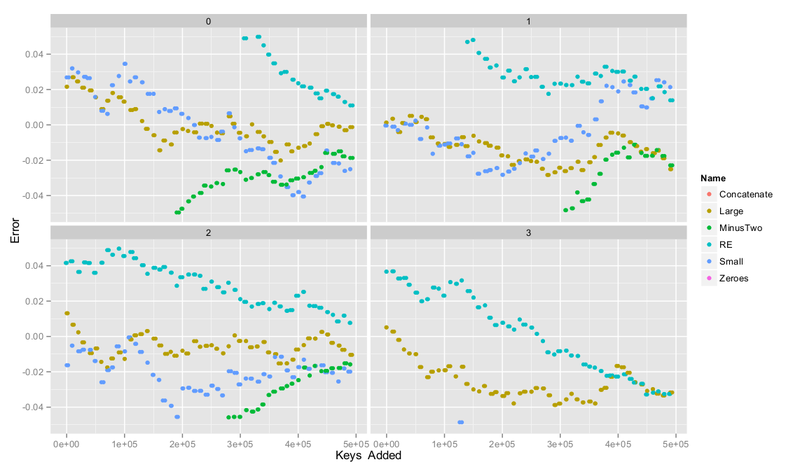 Below, we have graphs showing how the error decreases as more keys are added. Both graphs show the same data (the only difference being the scale on the y-axis). We have also graphed “Large,” an HLL of size , and “Small,” an HLL of size , which are shown only for comparison and are never doubled. One thing to note about the graphs is that the error is relative. 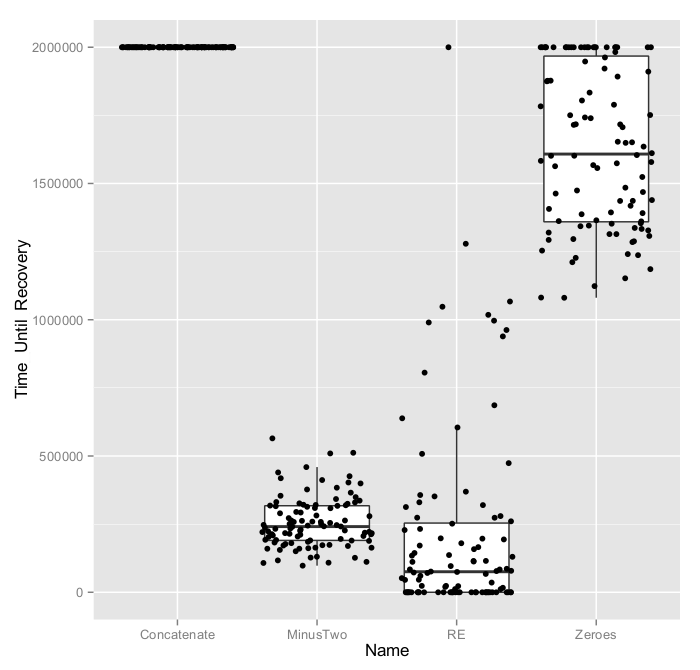 Notice that Concatenate and Zeroes perform particularly poorly. Even after 500,000 extra keys have been added, they still don’t come within 5% of the true value! For Zeroes, this isn’t too surprising. Clearly the initial error of Zeroes, that is the error immediately after doubling, should be high. A quick look at the harmonic mean shows why this occurs. If a single bin has a zero as its value, the harmonic mean of the values in the bins will be zero. Essentially, the harmonic mean of a list always tends towards the lowest elements of the list. Hence, even after all the zeroes have been replaced with positive values, the cardinality estimate will be very low. Notice that this last term is about equal to 2 times the cardinality estimate of the HLL before doubling. One quick thing that we can take away from this is that it is unlikely for two “partner” bins to have the same value in them (since if this happens frequently, we get an estimate close to that given by Concatenate – which is very inaccurate!). As for MinusTwo and RE, these have small initial error and the error only falls afterwards. The initial error is small since the rules for these give guesses approximately equal to the guess of the original HLL before doubling. From here, the error should continue to shrink, and eventually, it should match that of the large HLL. One thing we noticed was that error for Concatenate in the graph above suggested that the absolute error wasn’t decreasing at all. To check this we looked at the trials and, sure enough, the absolute error stays pretty flat. Essentially, Concatenate overestimates pretty badly, and puts the HLL in a state where it thinks it has seen twice as many keys as it actually has. In the short term, it will continue to make estimates as if it has seen 500,000 extra keys. We can see this clearly in the graphs below. I also ran 100 experiments where we doubled the HLLs after adding 500,000 keys, then continued to add keys until the cardinality estimate fell within 5% of the true cardinality. The HLLs were set up to stop running at 2,000,000 keys if they hadn’t arrived at the error bound. Notice how badly Concatenate did! In no trials did it make it under 5% error. Zeroes did poorly as well, though it did recover eventually. My guess here is that the harmonic mean had a bit to do with this – any bin with a low value, call it , in it would pull the estimate down to be about . As a result, the estimate produced by the Zeroes HLL will remain depressed until every bin is hit with a(n unlikely) high value. Zeroes and Concatenate should not do well since essentially the initial estimate (after doubling) of each HLL is off by a very large fixed amount. The graph of absolute errors, above, shows this. On the other hand, RE and MinusTwo performed fairly well. 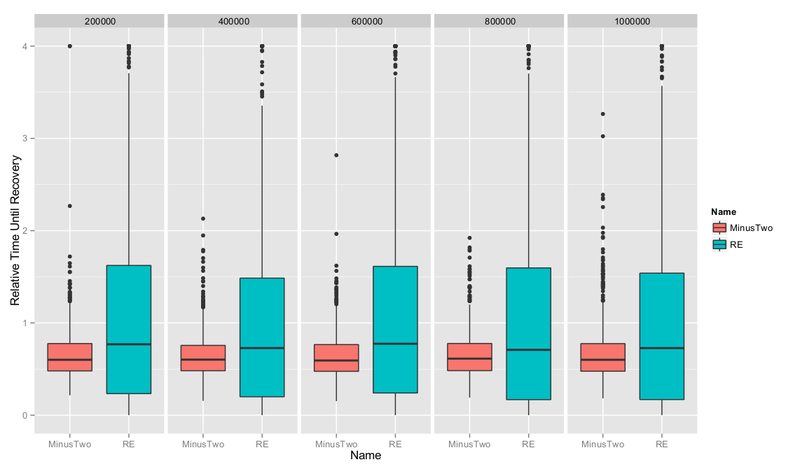 Certainly, RE looks better in terms of median and middle 50%, though its variance is much higher than MinusTwo‘s.This should make sense as we are injecting a lot of randomness into RE when we fill in the values, whereas MinusTwo‘s bins are filled in deterministically. One might wonder whether the recovery time of MinusTwo and RE depend on the size of the HLL before the doubling process. To get a quick view of whether or not this is true, we did 1,000 trials like those above but by adding 200K, 400K, 600K, 800K, 1M keys and with a a cutoff of 3% this time. Below, we have the box plots for the data for each of these. The headings of each graph gives the size of the HLL before doubling, and the y-axis gives the fractional recovery time (the true recovery time divided by the size of the HLL before doubling). Notice that, for each doubling rule, there is almost no variation between each of the plots. This suggests that the size of the HLL before doubling doesn’t change the fractional recovery time. As a side note, one thing that we found really surprising is that RE is no longer king – MinusTwo has a slightly better average case. We think that this is just a factor of the higher variation of RE and the change in cutoff. Of the four rules, MinusTwo and RE are clearly the best. Both take about 50 – 75% more keys after doubling to get within 3% error, and both are recover extremely quickly if you ask for them to only get within 5% error. To leave you with one last little brainteaser, an HLL of size , which is then doubled, will eventually have the same values in its bins as an HLL of size which ran on the same data. About how long will it take for these HLLs to converge? One (weak) requirement for this to happen is to have the value in every bin of both HLLs be changed. To get an upper bound on how long this should take, one should read about the coupon collector problem. In the Zipfian world of AK, the HyperLogLog distinct value (DV) sketch reigns supreme. This DV sketch is the workhorse behind the majority of our DV counters (and we’re not alone) and enables us to have a real time, in memory data store with incredibly high throughput. HLL was conceived of by Flajolet et. al. in the phenomenal paper HyperLogLog: the analysis of a near-optimal cardinality estimation algorithm. This sketch extends upon the earlier Loglog Counting of Large Cardinalities (Durand et. al.) which in turn is based on the seminal AMS work FM-85, Flajolet and Martin’s original work on probabilistic counting. (Many thanks to Jérémie Lumbroso for the correction of the history here. I am very much looking forward to his upcoming introduction to probabilistic counting in Flajolet’s complete works.) UPDATE – Rob has recently published a blog about PCSA, a direct precursor to LogLog counting which is filled with interesting thoughts. There have been a few posts on HLL recently so I thought I would dive into the intuition behind the sketch and into some of the details. Bit-pattern observables: these are based on certain patterns of bits occurring at the beginning of the (binary) S-values. For instance, observing in the stream S at the beginning of a string a bit- pattern is more or less a likely indication that the cardinality n of S is at least . In my mind HyperLogLog is really composed of two insights: Lots of crappy things are sometimes better than one really good thing; and bit pattern observables tell you a lot about a stream. We’re going to look at each component in turn. Even though the literature refers to the HyperLogLog sketch as a different family of estimator than KMV I think they are very similar. It’s useful to understand the approach of HLL by reviewing the KMV sketch. Recall that KMV stores the smallest values that you have seen in a stream. From these values you get an estimate of the number of distinct elements you have seen so far. HLL also stores something similar to the smallest values ever seen. To see how this works it’s useful to ask “How could we make the KMV sketch smaller?” KMV stores the actual value of the incoming numbers. So you have to store 64 bit values which is tiny, but not that tiny. What if we just stored the “rank” of the numbers? Let’s say the number 94103 comes through (I’ll use base 10 here to make things easier). That number is basically plus some stuff. So, let’s just store the exponent, i.e. 4. In this way I get an approximation of the size of numbers I have seen so far. That turns the original KMV algorithm into only having to store the numbers 1-19 (since ) which is a whole lot less than numbers. Of course, this estimate will be much worse than storing the actual values. In actuality HLL, just like all the other DV sketches, uses hashes of the incoming data in base 2. And instead of storing the “rank” of the incoming numbers HLL uses a nice trick of looking for runs of zeroes in the hash values. These runs of zeroes are an example of “bit pattern observables”. This concept is similar to recording the longest run of heads in a series of coin flips and using that to guess the number of times the coin was flipped. For instance, if you told me that you spent some time this afternoon flipping a coin and the longest run of heads you saw was 2 I could guess you didn’t flip the coin very many times. However, if you told me you saw a run of 100 heads in a row I would gather you were flipping the coin for quite a while. This “bit pattern observable”, the run of heads, gives me information about the stream of data it was pulled from. An interesting thing to note is just how probable long runs of heads are. As Mark Shilling points out, you can almost always tell the difference between a human generated set of coin flips and an actual one, due to humans not generating long runs. (The world of coin flipping seems to be a deep and crazy pit.) Disclaimer: The only thing I am trying to motivate here is that by keeping a very small piece of information (the longest run of heads) I can get some understanding of what has happened in a stream. Of course, you could probably guess that even though we have now reduced the storage of our sketch the DV estimate is pretty crummy. But what if we kept more than one of them? 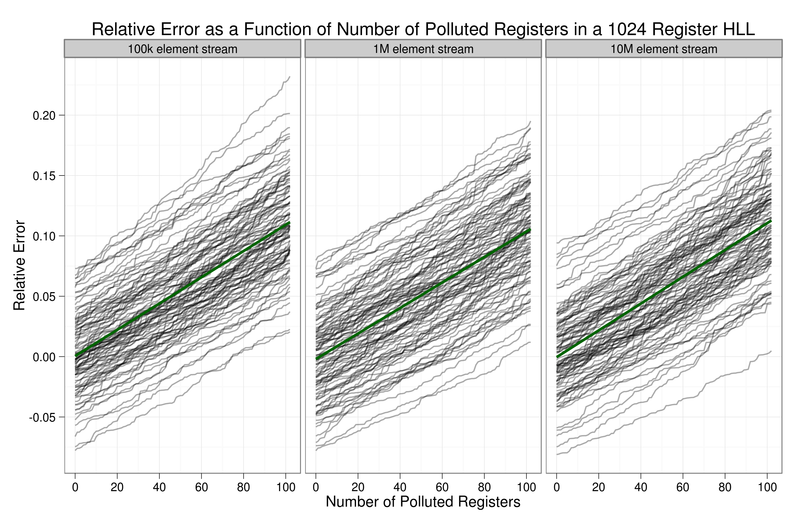 A fundamental insight that Flajolet had to improve LogLog into HyperLogLog was that he noticed the distribution of the values in the registers is skewed to the right, and there can be some dramatic outliers that really mess up the average used in LogLog (see Fig. 1 below). He and Durand knew this when they wrote LogLog and did a bunch of hand-wavey stuff (like cut off the top 30% of the register values) to create what he called the “SuperLogLog”, but in retrospect this seems kind of dumb. He fixed this in HLL by tossing out the odd rules in SuperLogLog and deciding to take the harmonic mean of the DV estimates. The harmonic mean tends to throw out extreme values and behave well in this type of environment. This seems like an obvious thing to do. I’m a bit surprised they didn’t try this in the LogLog paper, but perhaps the math is harder to deal with when using the harmonic mean vs the geometric mean. Fig. 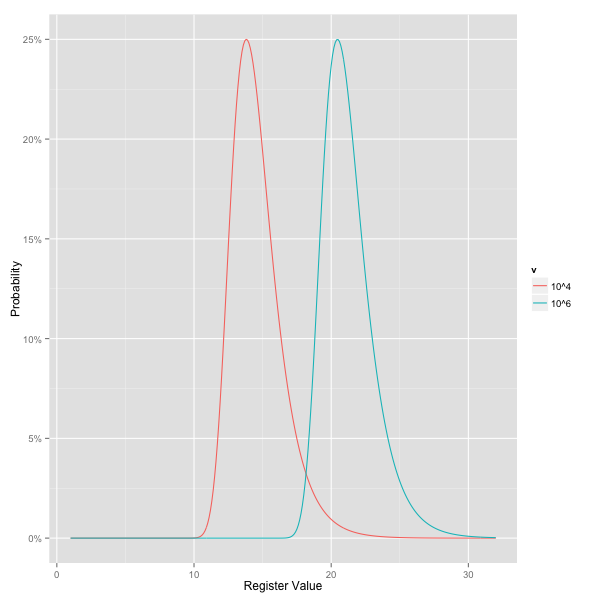 1: The theoretical distribution of register values after distinct values have been run through an HLL. Here is the longest run of zeroes in the bucket. Rob wrote up an awesome HLL simulation for this post. You can get a real sense of how this thing works by playing around with different values and just watching how it grows over time. Click below to see how this all fits together. To combine HLL sketches that have differing sizes read Chris’s blog post about it. In our research, and as the literature says, the HyperLogLog algorithm gives you the biggest bang for the buck for DV counting. It has the best accuracy per storage of all the DV counters to date. The biggest drawbacks we have seen are around intersections. Unlike KMV, there is no explicit intersection logic, you have to use the inclusion/exclusion principle and this gets really annoying for anything more than 3 sets. Aside from that, we’ve been tickled pink using HLL for our production reporting. We have even written a PostgreSQL HLL data type that supports cardinality, union, and intersection. This has enabled all kinds of efficiencies for our analytics teams as the round trips to Hadoop are less and most of the analysis can be done in SQL. We have seen a massive increase in the types of analytics that go on at AK since we have adopted a sketching infrastructure and I don’t think I’m crazy saying that many big data platforms will be built this way in the future. P.S. 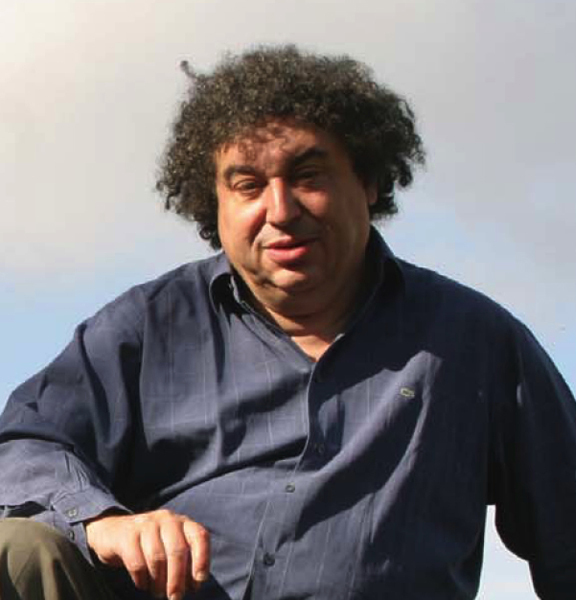 Sadly, Philippe Flajolet passed away in March 2011. It was actually a very sad day for us at Aggregate Knowledge because we were so deep in our HLL research at the time and would have loved to reach out to him, he seems like he would have been happy to see his theory put to practice. Based on all I’ve read about him I’m very sorry to have not met him in person. I’m sure his work will live on but we have definitely lost a great mind both in industry and academia. Keep counting Philippe! In my last post, I explained how to halve the number of bins used in an HLL as a way to allow set operations between that HLL and smaller HLLs. Unfortunately, the accuracy of an HLL is tied to the number of bins used, so one major drawback with this “folding” method is that each time you have the number of bins, you reduce that accuracy by a factor of . In this series of posts I’ll focus on the opposite line of thinking: given an HLL, can one double the number of bins, assigning the new bins values according to some strategy, and recover some of the accuracy that a larger HLL would have had? Certainly, one shouldn’t be able to do this (short of creating a new algorithm for counting distinct values) since once we use the HLL on a dataset the extra information that a larger HLL would have gleaned is gone. We can’t recover it and so we can’t expect to magically pull a better estimate out of thin air (assuming Flajolet et al. have done their homework properly and the algorithm makes the best possible guess with the given information – which is a pretty good bet!). Instead, in this series of posts, I’ll focus on how doubling plays with recovery time and set operations. By this, I mean the following: Suppose we have an HLL of size 2n and while its running, we double it to be an HLL of size 2n+1. Initially, this may have huge error, but if we allow it to continue running, how long will it take for its error to be relatively small? I’ll also discuss some ways of modifying the algorithm to carry slightly more information. Before we begin, a quick piece of terminology. Suppose we have an HLL of size 2n and we double it to be an HLL of size 2 n+1. We consider two bins to be partners if their bin numbers differ by 2n. To see why this is important – check the post on HLL folding. Colin and I did some thinking and came up with a few naive strategies to fill in the newly created bins after the doubling. I’ve provided a basic outline of the strategies below. Zeroes – Fill in with zeroes. Concatenate – Fill in each bin with the value of its partner. MinusTwo – Fill in each bin with the value of its partner minus two. Two may seem like an arbitrary amount, but quick look at the formulas involved in the algorithm show that this leaves the cardinality estimate approximately unchanged. RandomEstimate (RE) – Fill in each bin according to its probability distribution. I’ll describe more about this later. ProportionDouble (PD) – This strategy is only for use with set operations. We estimate the number of bins in the two HLLs which should have the same value, filling in the second half so that that proportion holds and the rest are filled in according to RE. The first three strategies given above are pretty self-explanatory, but the last two are a bit more complicated. To understand these, one needs to understand the distribution of values in a given bin. In the original paper, Flajolet et al. calculate the probability that a given bin takes the value to be given by where is the number of keys that the bin has seen so far. Of course, we don’t know this value ( ) exactly, but we can easily estimate it by dividing the cardinality estimate by the number of bins. However, we have even more information than this. When choosing a value for our doubled HLL, we know that that value cannot exceed its partner’s value. To understand why this is so, look back at my post on folding, and notice how the value in the partner bins in a larger HLL correspond to the value in the related bin in the smaller HLL. Hence, to get the distribution for the value in a given bin, we take the original distribution, chop it off at the relevant value, and rescale it to have total area 1. This may seem kind of hokey but let’s quickly look at a toy example. Suppose you ask me to guess a number between 1 and 10, and you will try to guess which number I picked. At this moment, assuming I’m a reasonable random number generator, there is a chance that I chose the number one, a chance that I chose the number two, etc. However, if I tell you that my guess is no larger than two, you can now say there there is a chance that my guess is a one, a chance that my guess is a two, and there is no chance that my guess is larger. So what happened here? We took the original probability distribution, used our knowledge to cut off and ignore the values above the maximum possible value, and then rescaled them so that the sum of the possible probabilities is equal to zero. RE consists simply of finding this distribution, picking a value according to it, and placing that value in the relevant bin. So how do we do this? Let’s say we have two HLLs: and . We wish to double before taking its union with . To estimate the proportion of their intersection, make a copy of and fold it to be the same size as . Then count the number of bins where and agree, call this number . Then if is the number of bins in , we can estimate that and should overlap in about bins. Then for each bin, with probability we fill in the bin with the the minimum of the relevant bin from and that bin’s partner in . With probability we fill in the bin according to the rules of RE. Recovery – after doubling, how long does it take for the error to decrease to an acceptable level? Unions – how well does doubling play with unions? Extra Bits – what are some other strategies to squeeze some extra accuracy out of the HLLs? Here at AK, we’re in the business of storing huge amounts of information in the form of 64 bit keys. 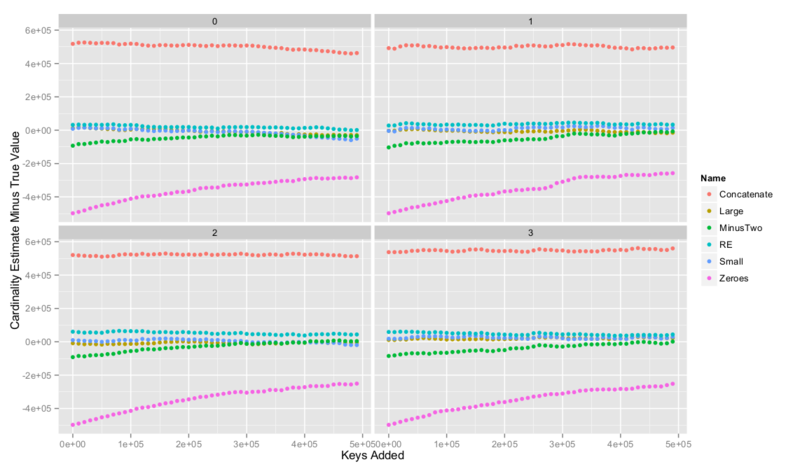 As shown in other blog posts and in the HLL post by Matt, one efficient way of getting an estimate of the size of the set of these keys is by using the HyperLogLog (HLL) algorithm. There are two important decisions one has to make when implementing this algorithm. The first is how many bins one will use and the second is the maximum value one allows in each bin. As a result, the amount of space this will take up is going to be the number of bins times the log of the maximum value you allow in each bin. For this post we’ll ignore this second consideration and focus instead on the number of bins one uses. The accuracy for an estimate is given approximately by 1.04/√b, where b is the number of bins. Hence there is a tradeoff between the accuracy of the estimate and the amount of space you wish to dedicate to this estimate. Certainly, projects will have various requirements that call for different choices of number of bins. The HLL algorithm natively supports the union operation. However, one requirement for this operation is that the HLLs involved are of the same size, i.e. have the same number of bins. In practice, there’s no guarantee that HLLs will satisfy this requirement. In this post, I’ll outline the method by which we transform an HLL with a certain number of bins to one with a fewer number of bins, allowing us to perform set operations on any two HLLs, regardless of size. Below I’ve shown how two HLLs (one of size 23 and one of size 24) process two different keys. 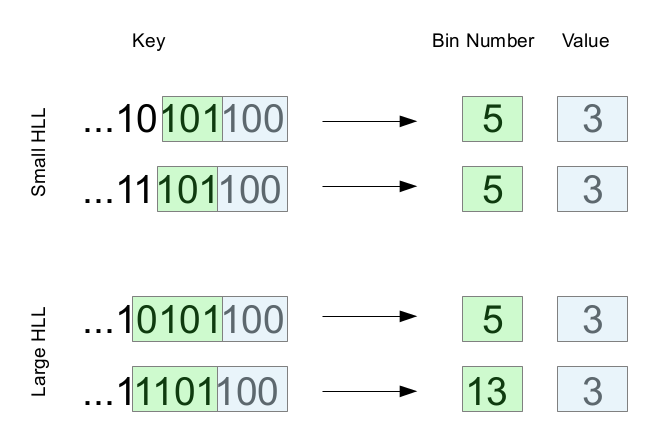 Here, the keys have the same value, because the purpose of this example is to illustrate how the location in which we place the key changes when the HLL has twice the number of bins. Above, the keys which are attributed to the fifth and thirteenth bins in the larger HLL would both have been attributed to the fifth bin in the smaller HLL. Hence, unraveling the algorithm a bit, we see that the values which are seen by the fifth and thirteenth bins in the larger HLL would have been seen by the fifth bin in the smaller HLL had they run on the same dataset. Because of this, in the case where the two algorithms estimate the same dataset, the value stored in the fifth bin in the smaller HLL is the maximum of the values stored in the fifth and thirteenth bins in the larger HLL. What happened above is not an isolated phenomenon. In general, if one uses the HLL algorithm twice on a dataset, once with 2n+1 bins and once with 2n bins, the value in the kth bin in the smaller HLL will be the maximum of the values in the kth and (k + 2n)th bins of the larger HLL. As a result, if given an HLL of size 2n+1 that one wishes to transform to an HLL of size 2n, one can simply fold the HLL by letting the value of the kth bin in the folded HLL be given by the maximum of the values in the kth and (k + 2n)th bins of the original HLL. In fact, we can fold any HLL an arbitrary number of times. Repeating this process, we can take an HLL of size 2n to an HLL of size 2m for any m which is less than or equal to n. Hence if we wish to perform a set operation on two HLLs of different sizes, we can simply fold the larger HLL repeatedly until it is the same size as the smaller HLL. After this, we can take unions and intersections as we wish. Below, we show a simple example of how folding works. Here we have an HLL with 23 bins which we fold to be an HLL with 22 bins. In the diagram, I’ve torn an HLL of size 23 in half and placed the strips side by side to emphasize how we line up bins and take maximums in the folding process. 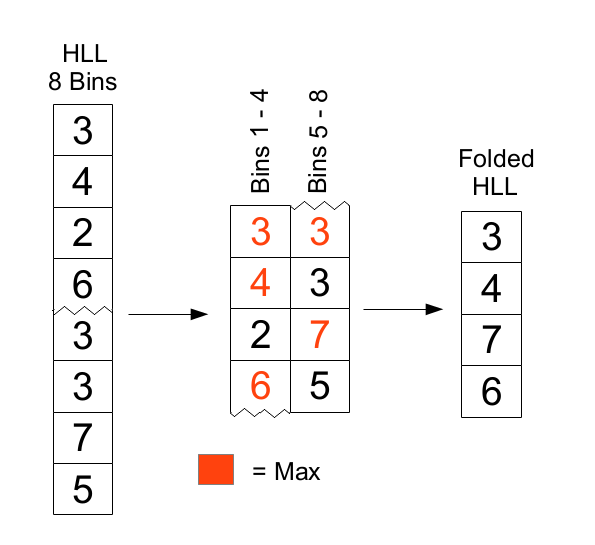 Notice that the values in the folded the bins of the folded HLL are the maximum of the relevant bins in the larger HLL. This technique gives us the flexibility to be able to perform set operations on any two HLLs regardless of the number of bins used in the algorithms. It’s usefulness in this regard is a bit offset by the fact that the accuracy of the estimate on these is limited by the accuracy of the least accurate HLL. For example, an HLL of size 210 will have accuracy roughly 23 times better than an HLL of size 2 (to see where I’m getting these numbers from, you’ll have to read the paper!). Unfortunately, if we combine these with a set operation, our resulting estimate will have the same accuracy as the smaller HLL with short term loans being taken from the RAM of the machine. The HyperLogLog algorithm supports set operations in a nice way only if the number of bins used is fixed. Using folding, one can correct for this by reducing the size of the larger HLL to the size of the smaller. The cost of this convenience is in the accuracy of the estimates after the folding process. In my next post, I’ll explore some methods of performing the set operations without this loss of accuracy. On Saturday Aggregate Knowledge hosted the third No BS Data Salon on databases and data infrastructure. A handful of people showed up to hear Scott Andreas of Boundary talk about distributed, streaming service architecture, and I also gave a talk about AK’s use of probabilistic data structures. The smaller group made for some fantastic, honest conversation about the different approaches to streaming architectures, the perils of distributing analytics workloads in a streaming setting, and the challenges of pushing scientific and engineering breakthroughs all the way through to product innovation. We’re all looking forward to the next event, which will be in San Francisco, in a month or two. If you have topics you’d like to see covered, we’d love to hear from you in the comments below! As promised, I’ve assembled something of a “References” section to my talk, which you can find below. Original HLL paper by Flajolet et al.